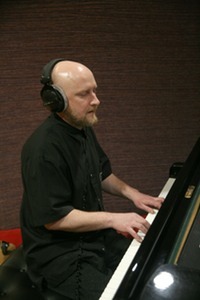 mainstream jazz, fusion jazz, acoustic jazz piano trio. Odyssey Trio - the Trio adventure. In the name of a trio there is a peculiar pun. The pianist, according to the passport, call Odyssey. Odyssey Bogussevich. One of the first in Post-Soviet Russia went on a legendary festival to Montreux. He acted solo on the main scene - Miles Davis Hall. Then - tours, articles in the press, popularity... However, congenital modesty and patriotism didn't allow the musician to emigrate, and Odyssey makes the decision to develop jazz traditions on Russian soil. He teaches at once in several educational institutions in Moscow and actively is engaged in the numerous solo and group projects. Jazz evenings in Red bar created a peculiar musical style of a trio. Accurate framework of jazz forms is indistinct if you were at an exhibition of artists impressionists who represented objects very familiar to you with the veiled handwriting peculiar to them. What subject sounds, - the jazz standard, folklore motive, a Doors group melody, Bach music or author's music - as a result is musical pictures of the person on holiday, the traveler, or left from cares that as it is impossible by the way in the megalopolis overflowed with vanity in the evening of an unlucky day.